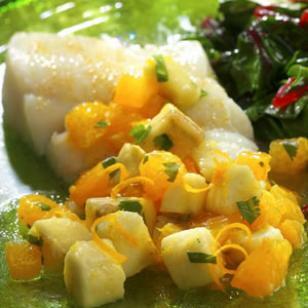 Sweet bananas combined with oranges, cilantro and lime juice create a fresh relish to serve with mild, white-fleshed fish, or try it alongside roast chicken or pork. To prepare fish: Preheat oven to 450°F. Lightly coat a baking sheet with cooking spray. Cut fish into 4 portions. Mix coriander and salt in a small bowl and sprinkle evenly on both sides of the fish. Place on the prepared baking sheet. Bake the fish until it is juicy and almost flakes when pressed with a knife, 8 to 12 minutes, depending on thickness. To prepare relish: Meanwhile, stir together bananas, orange zest, chopped oranges, cilantro, lime juice, coriander and salt in a medium bowl. To serve, spoon the relish over the roasted fish.